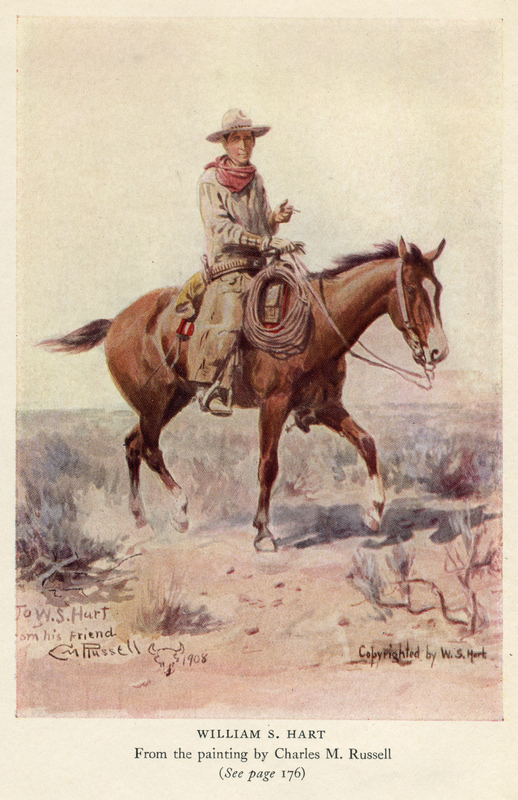 Frontispiece to William S. Hart's autobiography, "My Life East & West" (Houghton Mifflin Co. 1929): Detail from a 1908 painting of the author by the famous Western artist Charles M. Russell. "In February , we played Great Falls, Montana, and my good friends, Charlie and Nancy Russell, met us at the train and took our leading lady and me to their home for dinner. After dinner Charlie uncovered his latest work. It was a splendid painting of myself riding a bronc through the sagebrush. Charlie had done it for me. It is one of my most prized possessions." LW2433: 9600 dpi jpeg from book page.